Are you desperate and depressed because you have tried so many types of weight loss programs and gone on so many diets but you are still fat? Are you suffering from a lower quality of life and low self-esteem? Why not give try Shuang Hor products a try - afterall, you have already tried so many others, and still don't see any lasting satisfying results? Take a look at these real-life stories..
Ms B, 20s, was overweight since very young. She regularly feels tired, has constipation problem and frequent headache. First 2 weeks: 2 sachets Jia Hor Soya Protein + 1 sachet Jia Hor Fiber + 1 sachet Yung Kien Pollen, 3 times a day. Next 2 weeks: 1 sachet Protein + 1 sachet Fiber + 1 sachet Pollen, 2 times a day. Next 1 month: 1 sachet Protein + 1 sachet Fiber + 1 sachet Pollen, 1 time a day in the morning. Lost 8 kg in 2 months. Can wear a smaller size jacket. Smoother bowel movement. Feels more energetic and not as tired as last time. Mr J, 40, is a Type 1 diabetic patient since 11 years ago. He used to inject insulin 4 times a day, totaling 120 mmol/L. At that time, he weighed 120 kg. Even though he controlled his meal intake and exercised and changed his lifestyle, his weight still would not reduce. He doctor used to scold him and recommend that he see a nutritionist or hormone doctor. Despite that, his weight still remained high. He started to consume 4 capsules Yung Kien Ganoderma + 10 capsules Yung Kien Pollen + Jia Hor Soya Protein daily, for 3 months. Vertigo reaction: Very bad gastric. 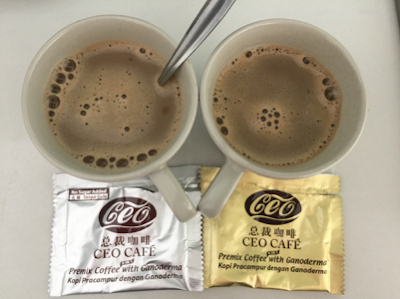 2 sachets Yung Kien Pollen + 1 sachet Jia Hor Fiber + 2 sachets Lactoberry + 1 sachet Jia Hor Soya Protein. Within 9 months, his weight dropped from 120 kg to 98 kg. Throughout, he continued to eat 3 meals a day and did not do much exercise. His doctor advised him to reduce his weight further. 1 Pollen + 1 Fiber + 1 Lactoberry + 1 Protein. Within another 9 months, his weight dropped to 75 kg. He’s very happy as he doesn’t need to wear XXL size anymore. He now wears M size. His insulin injection also reduced from 120 mmol/L a day to only 6 mmol/L a day. He is much healthier overall. A lady in her 60s weighs only 39 kg. She's extremely thin as she has no appetite to eat. She drank a shake of 2 sachets Jia Hor Soya Protein + 1 sachet Jia Hor Fiber with lots of water daily. After almost 14 days, she observed that she has much better appetite and good energy level. The enzymes help her body to absorb more food. A lady consumed a health shake comprising a combination of 2 sachets Jia Hor Soya Protein + 1 sachet Jia Hor Fiber + 1 sachet Yung Kien Pollen with the objective of losing weight. After only a few weeks, she slimmed down considerably. Her brother commented that her arms looked firmer, and her school friend said that her tummy looked smaller and her thighs slimmer. The best news was the monk at her weekly place of prayer could not recognise her due to her transformation. She said her mother was very happy when she heard that wonderful news. A 40 year old housewife consumes 1 sachet of Lactoberry probiotics in the morning and 1 sachet Lactoberry at night for maintenance. Healing reactions: She had diarrhoea 5-6 times a day where the stools that came out were coated with "oil" and looks like "curry". This lasted for 4-5 days. After about 2 months, she lost 11 kg. She used to have double chin; now her face is more V-shaped. She used not to be able to consume seafood, now she can. Ms A tried the 4-Prong Weight Management Solution in mid-2015, which encompasses a shake of Yung Kien Pollen, Lactoberry probiotics, Jia Hor Fiber and Jia Hor Soya Protein. After 1 month, she lost 2 kg and 1.5 inches around her arm and hip. She thought it was very amazing as she's already past 40 years old and it's not that easy to lose weight anymore. Furthermore, she's already a petite and slim lady. Subsequent to this 1 month, she maintained the shake combination but taking it only once a day. She didn't gain weight despite consuming more food during the CNY period. A 43 year old lady wanted to lose weight. She consumed a shake comprising 2 sachets Jia Hor Soya Protein + 2 sachets Jia Hor Fiber 3 times/day before meals. After 2 weeks she lost 2 kg. For the 3rd and 4th week, she took the same combination, but for 2 times/day. After 2 weeks, she lost another 2 kg. During this time, she changed to a healthier lifestyle, by eating light meals and swimming for exercise. Her constipation problem was completely gone, she has a more toned body, her complexion is brighter and she has smoother skin. After 1 month, she reduced to 2 Jia Hor Soya Protein + 1 Jia Hor Fiber, 2 times/day. Her weight has stabilised since then. Now she takes 2 Jia Hor Soya Protein + 1 Jia Hor Fiber every morning for maintenance. Miss F, 25, decides to try Shuang Hor products because she has been suffering from gastric and bloated stomach for about 4 years. She doesn't eat regular meals because she works in the F&B line. She also wants to lose weight. She consumes 6 sachets Jia Hor Soya Protein + 4 sachets Jia Hor Fiber + 4 sachets Lactoberry + 2 sachets Yung Kien Pollen a day. She mixes Protein + Fiber into a shake to drink half an hour before meals. She changes her daily diet by not taking anymore processed food like fish balls, sausages and hot dogs. She reduces her intake of carbo and fried food. She has more frequent urination and feels more energetic. For exercise, she goes hiking every 2 weeks and feels she has more stamina. She lost 8 kg over 3 months and is very happy with the drop in her clothes size. Ms SC's friend, 30s, was hospitalised because of her severe cholesterol problem. She found out about Shuang Hor products and started to take Lingzhi + Pollen. When she was studying in secondary school, she had the habit of skipping breakfast as she thought it would help her lose weight. Unfortunately, when you force yourself into a fasting mode, it would make you hungrier and have cravings for unhealthy food. She craved for chocolates. When she took Lingzhi + Pollen, her nutrients deficiency was restored back and her craving was gone. SC recommended her to try something to help her lose weight, which is a shake comprising of Yung Kien Pollen + Jia Hor Soya Protein + Jia Hor Fiber + Lactoberry probiotics. She agreed as she still need to drink and it is the fastest way to prepare her breakfast before rushing off to work. She drank 3 times a day before meals. Whenever she missed her lunch portion, she would double it up before dinner. She lost 10 kg in 1 month. She lost a further 6-7 kg in the next month. Her complexion looks radiant despite losing so much weight (as opposed to gaunt and haggard). Her craving for chocolates is gone. The annual medical checkup which her company pays for shows that only she and another colleague showed excellent health, despite having cholesterol problem 5-6 years ago and she being older now. In other words, this shake is not strictly for people who want to lose weight. Even people with perfect size and weight can take the shake to maintain their health. Ms Y said that during the Raya festivities period, she has been invited to many Raya events. She was invited to a function which she needed to wear baju kebaya. She found that the outfit has become too tight for her. She said fortunately there are Shuang Hor products available. She saw the results very quickly. This is what she did. Morning - take a combination of Yung Kien Pollen + Jia Hor Soya Protein + Jia Hor Fiber + Lactoberry. Mix with water and drink immediately as her breakfast. She feels full. Afternoon - eat as normal. She likes rice and thus consumes it as usual. Evening - she made the same shake again as per morning and take it as her dinner. After only 3 days, she tried on her outfit again and found that it could fit already. She ate as normal during the function. Then she continued with that routine over the next 2 weeks. She could still fit into her outfit until now. She said her weight loss solution is guaranteed effective. Please email me at askfuiping@gmail.com to buy Shuang Hor products as your weight loss solution. I have a very simple and effective 1-Month Weight Loss Program for you.